Please note: the catalogue does not reflect current availability. We will update the catalogue in August to reflect bare root availability for spring 2020. Please call us or email if you are looking for a specific variety. Roses arrive at the nursery in late February as bare-root plants and are ready to be planted at that time. We sell most of our roses this way, but we also grow roses in containers to be available by June. We carry David Austin, Pan American and Weeks roses and place our orders with these suppliers in mid summer for the following year. For more general information about our roses please see our Rose Information page. Note: Clean ‘n’ EasyTM roses are a Pan American selection of roses which are extremely easy to grow. They have excellent disease resistance and amazing bouquet-style blooms. This year’s selection includes: ‘Archbishop Desmond Tutu’, ‘Beverly’, ‘Eternal Flame’, ‘Francis Meilland’, ‘Grand Amore’, ‘Le Petit Prince’, ‘Perfumed Breeze’, ‘St. Tropez’ and ‘Summer Sun’. H: 5’ X S: 5’ (8′ as a climber) Large arching habit. Vigorous. Peachy pink. Immense full flowers. Strong fruity fragrance. Glossy healthy foliage. Repeat flowering. Can be trained as a small climber. Excellent back of the border filler. Best with some sturdy support. No overhead watering! H: 5′ x S: 4′ Long lasting and non-fading medium pink classic old-fashioned, cupped and quartered blossoms, produced on long cutting stems with a crisp, green apple fragrance. Vigorous tall and upright stature with large, dark green, and glossy foliage, with enhanced disease resistance. H: 3’ x S: 2’ Pure apricot paling around the edges. Strong, myrrh fragrance. Neat, bushy habit. Ideal for front of border. Tough, free flowering, healthy. H: 3’ x S: 3’ Loads of ruffled lavender with ruby blotches blossoms permeate the air with the strong perfume of sweet citrus. Has a low bushy habit and nearly continual flowering. Established plants give the most bloom. H: 3′ x S: 3′ An exceptionally free-flowering rose bearing neat warm pink rosettes held in large sprays. An exceptionally free-flowering variety with attractive arching growth. H: 4’ X S: 3’ (8′ as a climber) Glowing, deep red-pink rosette-shaped blooms. Lovely, intensely fruity fragrance. Very healthy with vigorous, bushy growth and repeat flowering. Ideal for containers. H: 4’ x S: 4’ A beloved member of the Rugosa species because of the nearly continual production of pure white large double flowers saturated with fragrance. Its smaller habit makes it easier to tuck in. Tough, hardy & naturally disease resistant. Red hips ripen in the fall. H: 3’ x S: 3’ Bushy and spreading. Dainty, loose-petalled, pure pink flowers. Bright orange hips. Repeat bloomer. Vigorous, easy to grow, hardy, very disease resistant. Can be used as groundcover, in mixed borders or containers. H: 3’ X S: 2.5′ Upright habit. Red buds open to rich salmon. Medium–strong fruity fragrance. Vigorous and healthy. Dark green glossy foliage. Excellent repeat bloomer. H: 4’ X S: 3’ Stout, bushy, habit. Huge globular flowers are soft to medium pink with ruffled edges. Old Rose fragrance. Repeat blooming. Dark green, healthy foliage. Can reach 8’ and be trained as a climber. H: 3-4’ x S: 2-3’ Big, double, ruffled blooms of a deep plum purple on a hardy, rounded plant. Good disease resistance and vigor with a pleasing subtle fragrance. H: 4’ x S: 4’ Large, golden yellow blooms age to antique cream. Strong, fruity tea fragrance. Bushy habit. Good repeat bloomer. H: 4′ x S: 3′ A soft butter yellow rose with exquisite cup-shaped flowers. Pleasant tea fragrance. Excellent repeat-flowering. Attractive bushy growth and good disease resistance. H: 3’ x S: 2.5’ Bright yellow blushing to orange and finishing deep red, sometimes striped. Deep dark green leaves & mahogany-red new growth. Larger flowers in cool conditions. Good disease resistance. H: 4-6’ x S: 3-4’ Held high on long stems, long pointed buds open to globular flowers of dark velvety red. This rose has a strong citrus scent and continuous flowering. Prefers full sun and lots of air circulation. H: 4’ x S: 4’ Rounded and bushy. Smokey lavender & rusty red-orange blend. Good repeat flowering over a long season. Moderate fragrance. Clean, glossy foliage. Interesting colour blend goes well with most other colours. H: 10-14’ A modernized version of Westerland with more petals, increased flower count per cluster and improved flower production well into the fall. Attractive salmony orange flower color that remains strong, combined with a nice fruity fragrance and a high level of disease resistance. H: 8’ X S: 5’ (Can be pruned to keep as a bush.) Large arching habit. Vigorous. Peachy pink. Immense full flowers. Strong fruity fragrance. Glossy healthy foliage. Repeat flowering. Excellent back of the border filler. Best with some sturdy support. No overhead watering! 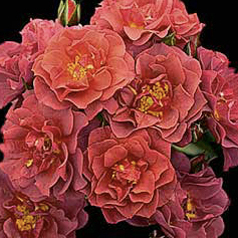 H: 8-12’ Large clusters of ruffled, red blossoms make a great display against the abundance of medium green leaves. Hardy & vigorous with good disease resistance. Blooms on old and new wood with good repeat flowering. H: 10-12’ This fast growing, vigorous plant bears an abundance of fully double coral-pink blooms throughout the season. Heavily fragrant with the spicy scent of cloves. Blooms on old and new wood. H: 8-12’ Clusters of large, double, warm apricot-gold flowers. Strong fruity fragrance. Free flowering from the first year and blooms on old and new wood. Super disease resistant. Vigorous, shiny green foliage. Sport of ‘Westerland’. 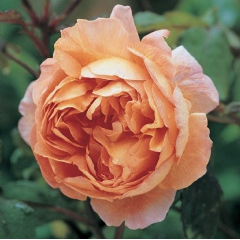 H: to 10’ Large, many petalled blooms with a beautiful blend of apricot colours. Superb myrrh fragrance with floral and honey character. A vigorous repeat-flowering climber with attractive mid green satin foliage. 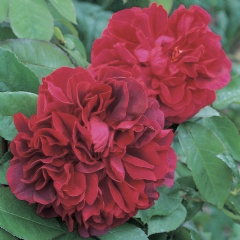 H: to 8′ as a climber (H: 4’ X S: 3’) Glowing, deep red-pink rosette-shaped blooms. Lovely, intensely fruity fragrance. Very healthy with vigorous, bushy growth and repeat flowering. Ideal for containers. H: 8’ as a climber (H: 4’ X S: 3’ as a shrub) Stout, bushy habit. Huge globular flowers are soft to medium pink with ruffled edges. Old Rose fragrance. Repeat blooming. Dark green, healthy foliage. May need summer pruning if grown as a shrub. H: 8’ (Can be pruned to keep as a bush.) Pale lemon buds open to large creamy-white blooms. Strong, myrrh with vanilla fragrance. Elegant, arching habit, plentiful foliage. Strong, healthy, reliable. H: 9’ (H: 5’ x S: 4.5’ as a shrub) Glorious, neatly formed rosettes of a lovely apricot-orange with a strong, fruity fragrance. A well-rounded, slightly arching growth. Repeat flowering and will take some shade. H: 12-14’ Deep velvety red. Strong, sweet fragrance. Large, full blossoms. Blooms on old and new wood. Glossy, dark green foliage. H: 6′ (H: 4’ x S: 3.5’ as a shrub) Large rich, dark, crimson flowers with a shallow, cupped shape, eventually turning to a wonderful shade of rich purple. Powerful Old Rose fragrance. The growth is strong, bushy and rather upright, with the flowers nodding nicely on the stem. 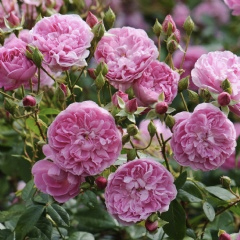 H: 6-8’ (H: 4’ x S: 3’ as a shrub) Old-fashioned type flowers are rich pink with a deeply fragrant Old Rose scent. Bushy, upright habit. Repeat blooming over a long season. H: 8-10′ (Can be pruned to keep as a bush.) Tall and upright. 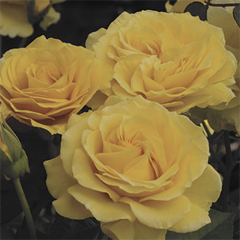 Rich topaz yellow, double cup-shaped flowers with a strong fruity, tea rose fragrance. Free flowering over a long season. Strong and healthy grower. Heavily laden branches may need some support. Shade tolerant. H: 10-12′ (Can be pruned to keep as a bush.) Tall and upright. Rich topaz yellow, double cup-shaped flowers with a slight tea rose fragrance. Free flowering over a long season. Strong and healthy grower. Heavily laden branches may need some support. Shade tolerant. H: 10-14’ Climbing form of an old favourite. Clusters of ice white blooms. Slight mild honey fragrance. Mostly summer flowering. Very showy in bloom. Provide good air circulation to guard against mildew. Shade tolerant. H: 10’ (H: 5′ x S: 3.5′ as a shrub) Strikingly beautiful, warm pink rosettes packed with many, perfectly arranged petals. Delicious Old Rose fragrance. Very healthy, repeat flowering and takes some shade. Almost thornless. H: 10-12’ Multicoloured – red, pink, orange, yellow. Good repeat bloomer. Very vigorous – allow lots of room. Loves heat. Best in full sun. H: 8′ (H: 4′ x S: 4′ as a shrub) Very large flowers with a medium yellow on the inside of the petals and a paler yellow on the outside. It has vigorous and almost completely disease-free growth. A very strong and delicious fragrance with a fruity note reminiscent of guava and sweet white wine. H: 8-10’ This plant is well contained and more compact than many climbers. The large ruffled old-fashioned blossoms hold their dark ruby red colour till the end of the flower’s life. H: 8’ (H: 4′ as a shrub). The young buds are a rich orange-red, opening to form chalice-shaped blooms. Pleasant, warm tea rose fragrance, with hints of spice apple and cloves. The mid-green leaves have attractive, slightly bronzed tones when young. Highly resistant to disease. H: 8-10′ Small, fully double soft yellow blooms, held in clusters. There is a delightful musky fragrance. Very healthy with exceptional repeat flowering throughout the summer until the first frosts. H: 8-12′ x S: 4′ Pastel pink flowers in clusters of large, fully double blooms with a strong clove spice and old rose scent. Blooms on new and old wood and will bloom the first season. One that is sturdy enough for cutting. Flower size: 4-5″. H: 6-9’ Glowing, golden yellow blooms edged in orange and somewhat similar to ‘Joseph’s Coat’ with more abundant and smaller blooms. Perfect for growing on a fence or trellis. This continually blooming plant has medium glossy green foliage. Tolerant of light shade. H: 8-10’ Rich golden hybrid tea shaped blooms. Cutting length stems. Blooms on old and new wood. Moderate fruity fragrance. H: 4-10′ x S: 4′ A strong-growing shrub. Large, almost single, creamy-white flowers are produced in closely packed, large bunches. An excellent pillar rose, it also threads through fences, frames windows, and reaches through open-habit shrubs to find the sky. A free flowering rose that is nearly always in bloom. Light fragrance. Tolerant of some shade. H: 10-12’ Loads of buttery yellow blooms even in the first year. Slight fruity fragrance. Will quickly cover a trellis, fence or wall. Hardy and healthy. H: 8-10’ Deep smoky purple blues with just a touch of cloudy white on the reverse. It blooms and repeats in its very first season. Moderate spice fragrance. The leaves are grey-green. H: 6-8′ (can be pruned to keep as a shrub). The centre petals form a rich, deep yellow cup, while the outer petals fall back and fade to palest yellow providing a most pleasing, two-tone effect. The growth is strong but graceful, displaying the flowers nicely. Pleasant, medium-strong tea rose fragrance. Good disease-resistance and repeat-flowering. H: to 10′ (Can be pruned to keep as a bush) A soft glowing pink at the centre, shading to palest pink on the outer petals. Delicious fragrance with aspects of Old Rose, musk and myrrh. Strong, elegantly arching growth with polished dark green foliage. It is highly resistant to disease. H: to 15′ S: 7-8′ Produces long and slender flexible stems that bear sprays of semi-double flowers with a lovely, delicate blush pink colour. Each about two inches across, with an open formation, exposing golden stamens with a citrus fragrance. It repeat flowers regularly throughout the summer. 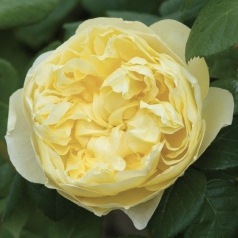 H: 8’ (H: 4.5’ x S: 3’ as shrub) An excellent pure yellow rose, that combines unusually strong and healthy growth with blooms of the utmost delicacy and charm. Its fine fragrance is a perfect balance between a classic tea scent and the English Rose, myrrh fragrance. H:10-12’ The tropical warmth comes in the form of rich sunset-like orange with a purple smoke layer and bright cream stripes. It has a moderate fruity to apple like fragrance. Prolific and vigorous this rose reaches its mature size in 3 years. Dark burgundy new shoots and very glossy leaves also add to its attraction. H: 7-8’ Blended peachy orange blossoms with a strong spice and rose fragrance. Highly disease resistant and vigorous. Blooms freely the first season on old and new wood. Best grown against a wall or trellis. H: 8′ (Can be pruned to keep as a bush.) The plump buds have attractive flashes of red. These open to form round, rich buttery yellow coloured blooms which eventually pale to a softer creamy colour. Even when the flowers are fully open, they retain their beautifully rounded chalice shape. A particularly healthy, upright and bushy shrub with many stems shooting from the base. Very few thorns. Extremely fragrant with a distinctive myrrh scent. H: 10-15’ x S: 6-8’ Produced freely and with a wonderful fragrance, these semi-double blooms are a pure shade of bright rose-pink. They are almost thornless making training and pruning a much more pleasant job. 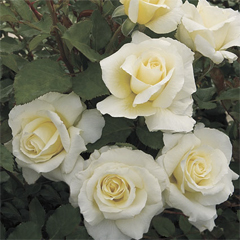 H: 4.5’ x S: 4’ (8’ as a climber) Pale lemon buds open to large creamy-white blooms. Strong, myrrh with vanilla fragrance. Elegant, arching habit, plentiful foliage. Strong, healthy, reliable. H: 5’ x S: 4.5’ (to 9’ as a climber) Glorious, neatly formed rosettes of a lovely apricot-orange with a strong, fruity fragrance. A well-rounded, slightly arching growth. Repeat flowering and will take some shade. Some summer pruning required to keep as a shrub. H: 4’ x S: 3’ White, chalice-shaped blooms with a hint of pink. Strong and very healthy with broad, open growth. Intense myrrh fragrance. H: 4′ x S: 3′ Large, cupped, fully double 4″ blooms with ruffled petals are bronze-brown in the center shading to orchid pink toward the edges. A rare beauty. Heady, myrrh fragrance, an outstanding rose on a continually blooming upright bushy plant. H: 4’ x S: 4’ Full of sunshine these blossoms are a pure even gold yellow with a fruity, sweet spice aroma. The old-fashioned blooms are produced in beautiful rounded clusters on vigorous stems and will hold their colour until the petals drop. H: 3-5’ x S: 2-4’ This prolific bush provides lots of creamy pointed buds that open to a rich, creamy white edged strawberry red with the rays of the sun. Beautiful double blooms with a fruity, citrus, spicy fragrance. Deep green leaves. H: 4’ x S: 4’ Swirls of mango orange, peach pink and ripe apricot. Large clusters of ruffled blooms with a fruity fragrance. Glossy bright green leaves. Rounded bushy habit. Vigorous, healthy. Moderately fragrant. H: 3’ x S: 3’ Medium-large double flowers are a golden peachy yellow. Moderate fruity fragrance with bright green foliage. A consistent performer in all climates and very disease resistant. A bushy, rounded plant that is great in mass plantings and containers. H: 3-5′ x S: 3′ Long lasting creamy-white blooms are large and sprightly with an occasional pink blush on the outer petals and a mild tea fragrance. Long lasting and non-burning. Glossy green foliage. Has shown strong resilience to rose diseases. H: 4’ x S: 3’ Medium size, upright and bushy. Huge 5” smoky plum purple flowers. Strong spicy clove fragrance. Old fashioned in appearance. Gets better and produces more blooms as it becomes established. H: 2-3’ x S: 2-3’ The cupped blooms are a soft apricot gold with lighter edge. Though the plant has a short compact and bushy habit the blooms are large and plentiful. A strong fruity and fresh cut apple fragrance. H: 4’x S: 3.5’ (6 ft. as a climber) Large crimson flowers with a shallow, cupped shape. The blooms are a rich, dark crimson colouring at first, eventually turning to a wonderful shade of rich purple. Powerful Old Rose fragrance. The growth is strong, bushy and rather upright, with the flowers nodding nicely on the stem. If you want to grow this rose as a shrub it may benefit from summer pruning. 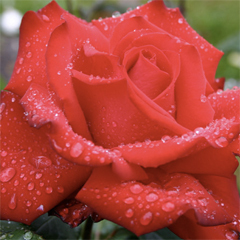 H: 5-6’ x S: 3’ Upright with long-stems bearing rich-red exceptionally fragrant (fruity, musk, old rose) blooms. A vigorous bushy plant with semi-glossy, deep green leaves. This repeat blooming rose is almost thornless, can take the heat and is disease resistant. The Flower Carpet series of roses are low growing and spreading. They are known for their low maintenance, minimal pruning and disease resistance. Very versatile, they can be used for mass planting, accents and containers. Long blooming with small glossy leaves. Somewhat shade tolerant. See below for the current colour range. H: 24-28” x S: 24” From amber to apricot blooms on vigorous and arching branches. H: 24-32″ x S: 40″ Self cleaning, pastel pink blooms arranged in large clusters. H: 24-36” x S: 36” Hot pink blooms. ADR disease resistance designation. H: 2-2.5′ x S: 3′ Vibrant dark red double blooms from late spring right into fall. H: 32-36” x S: 24” Masses of buttercup yellow flowers all season long. More upright in growth than the traditional Flower Carpet ground cover. Extremely disease resistant and very easy to grow. 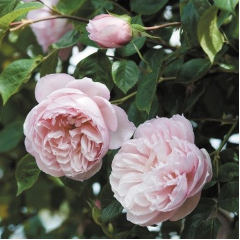 H: 4’ x S: 3’ (H: 6-8’ as a climber) Old-fashioned type flowers are rich pink with a deeply fragrant Old Rose scent. Bushy, upright habit. Repeat blooming over a long season. H: 4’ x S: 5’ (Can be trained as a climber) Rounded vigorous habit. Large, fully double, rich golden yellow blooms. Strong fruity, tea rose fragrance. Glossy, dark green foliage. Slightly rounded, arching habit. Good repeat flowering. Can be trained as a small climber. 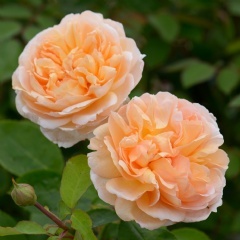 H: 4’ x S: 4’ An outstanding rose with large fully cupped double blossoms of pure apricot to orange. Thornless stems! Delicious, warm tea fragrance. Very healthy and repeat flowers extremely well. H: 5’ x S: 4’ (Can be trained as a small climber). Tall and upright. Rich topaz yellow, double cup shaped flowers with a slight tea rose fragrance. Free flowering over a long season. Strong and healthy grower. Heavily laden branches may need some support. Shade tolerant. H: 4’ x S: 5’ Upright habit. Large, semi-double, deep magenta flowers. Intoxicating fragrance. Large orange, red hips. Medium green, glossy crinkled foliage with good fall colour. Tough and highly disease resistant. Avoid chemical sprays. Good for exposed sites. H: 3.5’ x S: 4’ Large, very double pure yellow blooms with a fruity fragrance. Very disease resistant and continually blooming with rich green foliage. 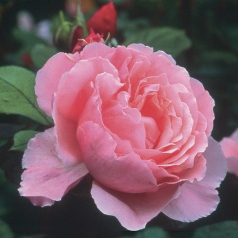 H: 4’ x S: 3’ A tough little rose that bears flowers of the most perfect formation – shallow cups of the purest rose pink. It has a strong, pure Old Rose fragrance that has been described as reminiscent of rose-based cosmetics. The plant has a bushy habit, maturing into an attractively rounded shrub with its flowers almost to ground level. The young foliage is bronze at first, later becoming green. H: 4’ X S: 3’ Upright habit. Large, fully double, deep crimson flowers with a deep rosette shape. Strong fragrance with overtones of cedar. Healthy with dark green shiny leaves. H: 3’ x S: 3’ Bushy. Smokey chocolate orange. Moderate Old Rose fragrance. Unique colour. Very healthy. Good repeat bloom. Very showy fragrant double brilliant red flowers from early summer into fall. The only true crimson bloom found in the rugosa group. A plant with lovely, shiny dark green foliage that is drought and heat tolerant. H: 3’-4’ x S: 3’ Clusters of long pointed buds become ice white blooms, Slight mild honey fragrance. Very floriferous during summer. Dark green foliage. Tolerant of some shade and disease resistant but likes good air circulation. H:3-4′ x S: 2-3′ No other modern rose captures the deep purple-red bud and velvety plum flower colour of this award winner. It has a powerful perfume of citrus and rose. Established plants give more blooms and best colour. H: 5 ′ x S: 3.5′ (10’ as a climber) Strikingly beautiful, warm pink rosettes packed with many, perfectly arranged petals. Delicious Old Rose fragrance. Very healthy, repeat flowering and takes some shade. Almost thornless. H: 4′ x W 4′ (8′ as a climber.) Very large flowers with an incurved chalice shape, their color is medium yellow on the inside of the petals and a paler yellow on the outside. It has excellent, strong and almost completely disease-free growth. A very strong, unusual and delicious fragrance with a fruity note reminiscent of guava and sweet white wine. H: 3’ x S: 3’ Rounded and bushy. Butter gold. Strong licorice candy and spice fragrance. Old fashioned in appearance. Very healthy and disease resistant. Good repeat bloom. Very consistent in all climates. H: 3’ x S: 3’ Large showy clusters of gently ruffled peachy-pink long-lived flowers. Round bushy habit with loads of glossy green leaves & consistent dark red new growth. Slightly scented but with continuous flowering. H: 3-4′ x S: 4′ Elegant buds of coppery-orange veined with red open to attractively waved petals. Fragrant. Free and continuous flowering. Rather sprawling growth. A good cut flower. H: 3-4′ x 3′ A velvety layer of the brightest red on a backside of darkest yellow set atop green glossy leaves. Better yet, the flowers hold on to their attention-getting tones to the very end…dropping from the well-behaved rounded plant just in time to welcome the next round of abundant bloom. Best flower size in cooler conditions. Mildly fragrant. H: 3-4’ x S: 3’ The cocoa is creamy like latte. But the latte goes loco to finish a solid soft lavender! With long pointed buds, these lightly fragrant blooms are early to bloom and long lasting on the plant and in the vase. H: 4.5’ x S: 3’ The tight buds are dark red with dashes of orange. The fully open flowers are a lovely mixture of rich tangerine-orange and yellow-orange on the outside. Strong fragrance with hints of pear, grape and citrus fruits. Fairly upright, bushy habit. Free flowering. H: 4’ x S: 3.5’ (8’ as a climber). The young buds are a rich orange-red, opening to form chalice-shaped blooms. Pleasant, warm tea fragrance, with hints of spice apple and cloves. The mid-green leaves have attractive, slightly bronzed tones when young. Highly resistant to disease. H: 3-4’ x S: 3’ The cuppy old-fashioned flowers open yellow and then are kissed with a pink blush, keeping the coloration until the petals drop. Fruity fragrance and glossy green leaves. Well known favourites Julia Child and Stormy Weather are the parents. H: 3’ x S: 3’ Rounded habit. Apricot-orange. Blooms constantly. Moderate fruity fragrance. Very healthy, glossy foliage. Great in mass plantings. Lots of twiggy growth. H: 4-5’ x S: 2-3’ Most unusual buds of apricot washed with green on the outermost petals open to big buxom blooms of creamy apricot. A gown of deep green leaves graces the cutting length stems. The best apricot for hot weather and long lasting as a cut flower. H: 4’ x S: 4’ Upright to columnar habit. Big clusters of well-formed buds open to sparkling white blooms on long stems. Good cut flower with a delightful, spicy fragrance. Highly resistant to blackspot, mildew and rust. H: 3’ x S: 2.5’ Crimson buds open to deep velvety maroon. Strong Old Rose fragrance. Bushy habit, broad form. Disease resistant. H: 5’ x S: 4′ Large 5” blooms of striking deep pink randomly striped with white are produced on long cutting stems. Intense floral aroma of sweet & classic rose fragrance. Has excellent disease resistance, grows vigorously with healthy, glossy green foliage. H:4-5’ S: 2.5’ Big blossoms of luscious lavender tinged with just a touch of purple. Certain to garner awards, the abundant blooms arrive on a praise-worthy plant with large glossy green leaves, good vigor and strong vitality. H:6′ x S:4′ Soft pink upper petals have peach pink reverses. The foliage is elongated and very dark green with a lustrous quality that is surprisingly clean. It has an unmatched fragrance of intense, sweet honeysuckle. Its vigor will require you to disbud the many side buds if you want long stemmed single flowers, but if you let them all bloom, you can cut big sprays of large flowers that will fill any house with its sweet aroma. Extremely prolific for a large rose and very quick to repeat. H: 4-6′ x S: 3-4′ Clusters of elegantly pointed buds open into ever-changing yellows, oranges and reds to form an intoxicating blend of autumn colors. Lightly fragrant with glossy green leaves and dark red new shoots. H: 3 x S: 2.5’ The shallowly cupped rosettes are a lovely soft shade of pink with a strong, pleasing fragrance with distinct fruity tints. The growth is vigorous, it repeat-flowers well and is very disease-resistant. H: 4-5’ x S: 3-4 Classically shaped, rich red flowers are borne on tall stems-perfect for cutting. This outstanding rose was bred from two of the best red roses of all time, Olympiad and Ingrid Bergman. Slightly fragrant with dark green foliage. H: 4-6′ x S: 3’ Very large and full blooms that are lemony yellow, edged in pure pink. Mild fruity fragrance. Large glossy green foliage. Easy to grow. 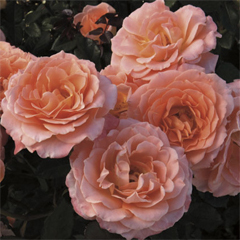 H: 5′ x S: 3.5′ Medium sized, flat rosette, flowers of rich apricot colouring. They have a rich Tea fragrance. The foliage and young stems are bronzy-red at first, becoming a fairly dark green. The growth is vigorous and rather upright, making it ideal for the back of a mixed border. It is very resistant to disease. H: 3-4’ x S: 3’ A beautiful, even shade of dark pink with glossy green foliage. Sweet scented with peony and spice. H: 3.5′ x S: 2.5′ Unusually large deeply cut blooms are a warm glowing pink. Light tea fragrance. Very healthy variety. H: 4-5’ x S: 3-4’ A profusion of pleasing clear pink buds and large blooms on long-stemmed clusters. A moderate tea rose fragrance. 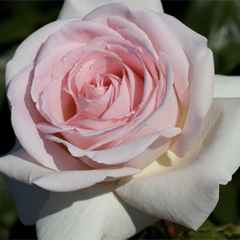 H: 4′ x S: 2.5’ A charming rose with soft apricot pink, cup-shaped flowers and elegant, upright growth. There is a classic myrrh fragrance. Exceptionally healthy, repeat flowering and will tolerate poorer soil. H: 1.5′ x S: 3’ This vigorous ground cover flowers abundantly from frost to fall. The branches stay low to the ground supporting a mass of vibrant yellow-gold blushed with pink blooms. H: 4’ x S: 4’ Almost continuous blooms of orange-red buds open to cupped peach rosettes with a lovely Tea fragrance. It matures into a very attractive, rounded, bushy shrub with few thorns. 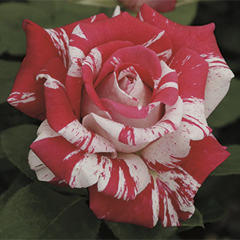 H: 3-4’ x S: 3’ Each petal is unique – some more burgundy-splashed-white, some more cream-swirled-red. A strong sweet spice fragrance and distinctive clean quilted foliage. H: 3-4’ x S: 3’ Flowers are yellow brushed by deep pink that are more like a Hybrid Tea in size and form. With a strong rose and fruit fragrance. Glossy green leaves. H: 3-4’ x S: 3’ The flowers hold on to their pure hot yellow tones to the very end, dropping away from the well-behaved plant just in time to welcome the next round of bloom. Loads of bright, super-glossy apple green leaves mirror the blazing blossoms. H: 4’ x S: 4′ Cupped rosettes of pure rose pink that gradually pales to a lighter pink at the edges of the petals, eventually exposing glimpses of yellow stamens at the centre. Glossy, dark green foliage. A strong and delicious myrrh and (heather) honey fragrance. H: 4-5′ x 2-3′ This exquisite pure white hybrid tea glows like moonlight. The full, classically formed blooms are saturated with intensely sweet citrus and rose fragrance that nearly bowls you over. Very dark green-black, glossy leaves make the white flowers pop all the more. Good rebloom, natural vigour, superior disease resistance and long cutting stems make this a perfect addition for a cutting garden. Fragrance is an intense sweet citrus and rose. Larger flower size in cool temps. H: 4’ X S: 3.5’ (6-8 ft. as a climber). The centre petals form a rich, deep yellow cup, while the outer petals fall back and fade to palest yellow providing a most pleasing, two-tone effect. The growth is strong but graceful, displaying the flowers nicely. Pleasant, medium-strong Tea Rose fragrance. Good disease-resistance and repeat-flowering. H: 4′ x S: 3.5′ (6-8′ as a climber). Large, bright crimson blooms. They are beautifully formed; deeply cupped with loosely packed petals intertwined at the centre of each bloom. There is a pleasing Old Rose fragrance. It is a good choice for cutting for arrangements in the home. It forms a healthy, medium-sized shrub with robust, bushy and spreading growth. May need some summer pruning if grown as a shrub. H: 5’ x S: 3’ An impressive variety, bearing masses of very large pink blooms almost continually from June until the first frosts. They have a strong, warm myrrh fragrance. H: 2.5’ x S: 3’ A very useful little shrub with graceful, spreading and fan-like growth. Sprays of tiny, soft pink pompon flowers. Flowers almost continuously from June till frost. Tough, reliable and disease-free. H: 5′ x S: 4′ (Can be trained as a climber.) A soft glowing pink at the centre, shading to palest pink on the outer petals. Delicious fragrance with aspects of Old Rose, musk and myrrh. Strong, elegantly arching growth with polished dark green foliage. It is highly resistant to disease. 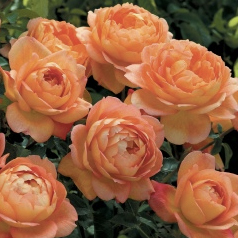 H: 3.5’ x S: 2.5’ Large 4″ blooms, a beautiful shade of rich pure apricot that pales towards the outside of the bloom. Strong Tea fragrance which has hints of cedar wood and vanilla. Repeat flowering, standing up well to rain and disease resistant. H: 5′ x S: 3′ Tall and airy growing habit. The cupped flowers are a pleasing light apricot colour, produced from the ground upwards in heads of up to fifteen, nicely spaced blooms. They have a light fragrance between Tea and myrrh. 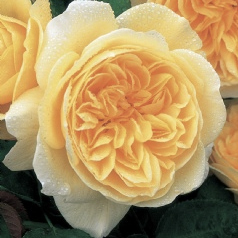 H: 4.5’ x S: 3’ (8’ + as climber) An excellent pure yellow rose, that combines unusually strong and healthy growth with blooms of the utmost delicacy and charm. Its fine fragrance is a perfect balance between a classic Tea scent and the English Rose, myrrh fragrance. H: 4’ x S: 3’ An unfading, strong yellow bloom and shiny green foliage. The growth is low and naturally rounded, making it an ideal rose for a position towards the front of the border. There is a rich fragrance with strong lemon tints at first, becoming sweeter and stronger with age. H: 3-4’ x 3-4′ This rounded, bushy, well-behaved rose produces vigorous stems ending with clusters of long-lasting red flowers. A moderate fruity fragrance and excellent disease resistance. H: 2-5’ x S: to 7’ Large, arching, bushy habit, Clusters of pale yellow, aging to cream, semi-double flowers with showy orange stamens. Fruity fragrance. No hips. Free flowering and vigorous. Healthy and tough. H: 12-16″ x S: 18-24″ Loads of shiny bright orange blooms sparkle against the abundant deep glossy green leaves…and they carry that bright color well through the life of the flower. Mild tea fragrance. Great for in a patio pot or tucked into the garden border. .
H: 12-24″ x S: 18-24 Peach and yellow blend blushed with dark pink. Slightly fruity fragrance. Suitable for patio pot. When grown in full sun the light red on the petals on this 2″ bloom become a dark red. The flowers first open as a deep yellow, flush with dark red as the flowers fade to a pink. The plant usually has all three stages on it at any given time making it look as though there are 3 different roses on the same plant. H: 1’ x S: 1’ Lots of glossy leaves covered with perfectly pointed cheery cherry-red buds that turn into big clusters of fully double flowers which hold their ruby ruby color to the very finish. Suitable for patio pot. H: 3-4’ x S: 2-3’ Big, double ruffled blooms of a deep plum purple on a hardy, rounded plant. Good disease resistance and vigor with a pleasing subtle fragrance. H: 2.5’ X S: 2’ Deep, rich crimson tinged with mauve. Short, shrubby habit perfect for the front of a bed or border or a large container. Sweet fruity fragrance. Upward facing blooms in the rosette style. Free flowering. H: 4’ x S: 4’, Full of sunshine these blossoms are a pure even gold yellow with a fruity, sweet spice aroma. The old-fashioned blooms are produced in beautiful rounded clusters on vigorous stems and will hold their colour until the petals drop. Swirls of mango orange, peach pink and ripe apricot. Large clusters of ruffled blooms with a fruity fragrance. Glossy bright green leaves. Rounded bushy habit. Vigorous, healthy. Huge 5” smoky plum purple flowers. Strong spicy clove fragrance. Old fashioned in appearance. Gets better and produces more blooms as it becomes established. Upright with long-stems bearing rich-red exceptionally fragrant (fruity, musk, old rose) blooms. A vigorous bushy plant with semi-glossy, deep green leaves. This repeat blooming rose is almost thornless, can take the heat and is disease resistant. Clusters of ice white blooms. Slight mild honey fragrance. Mostly summer flowering. Very showy in bloom. Provide good air circulation to guard against mildew. Shade tolerant. Rounded and bushy. Butter gold. Strong licorice candy and spice fragrance. Old fashioned in appearance. Very healthy and disease resistant. Good repeat bloom. Very consistent in all climates. H: 3-4′ x 3′ A velvety layer of the brightest red on a backside of darkest yellow set atop the green glossy leaves. Better yet, the flowers hold on to their attention-getting tones to the very end…dropping from the well-behaved rounded plant just in time to welcome the next round of abundant bloom. Best flower size in cooler conditions. Mildly fragrant. A hot, tropical blend of apricot-orange and golden yellow. Enormous old-fashioned full flowers in a clear pink with a lavender wash are saturated with a strong classic old rose fragrance. Very few thorns on long stems with clean green leaves. Thrives on heat. Very disease resistant. H: 3’ x S: 2’ Beautiful rich yellow rosettes continue all season. Even upright growth and little or no disease. It has a characteristic Tea Rose fragrance with a musky background. H: 5’ x S: Large 5” blooms of striking deep pink randomly striped with white are produced on long cutting stems. Intense floral aroma of sweet & classic rose fragrance. Has excellent disease resistance, grows vigorously with healthy, glossy green foliage. H: 4’ x S: 3’ Bears numerous, cupped flowers, with visible yellow stamens. The colour is a soft pink shading to a paler pink on the outer petals. Upright growth with its flowers held above the foliage. It flowers freely and continuously and has a powerful myrrh fragrance. 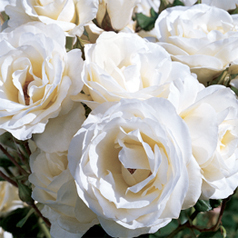 H: 4-5′ x 2-3′ This exquisite pure white hybrid tea glows like moonlight. An intensely sweet citrus and rose fragrance with good rebloom and long cutting stems. Very dark green-black, glossy leaves with superior disease resistance. Larger flower size in cool temps. H: 2-4’ x S:2-3’ Lavender with a magenta-colored heart on the inner petals. Violet’s Pride undeniably belongs to the aristocracy of the rose world with dense foliage, resilience from diseases and a sophisticated grapefruit and fruit-like fragrance. H: 2’ x S: 2′ Brilliant orange-scarlet on long-lasting ruffled blossoms set against the disease-resistant glossy green foliage. Naturally compact and bushy. H: 3-4’ x S: 3-4’ This vigorous and disease resistant plant has smokey red to pink blooms that go from summer to late fall. H: 2’-3’ x S: 2′-3’ Bright orange juice tones lasts to the very end of every long-lived blossom. Set against deep mahogany red new growth & glossy green leaves this rounded compact plant can tuck into a smaller space. Moderate spicy fragrance. H: 4-5’ x S: 3’ Upright and bushy habit. Red-purple with a lavender eye. Strong citrus and rose fragrance. Semi-double flowers look like camellias. Vigorous and healthy. H: 4′ x 3′ The blooms start as perfectly rounded buds, opening to full, cupped flowers that are rich cream at first, fading to almost pure white in the sun. Blooming from late spring to fall, an excellent repeat bloomer. Strong fruity fragrance with a delicate hint of citrus. H: 5’ x S: 3’ (8ft as a climber). The plump buds have attractive flashes of red. These open to form round, rich buttery yellow coloured blooms which eventually pale to a softer creamy colour. Even when the flowers are fully open, they retain their beautifully rounded chalice shape. A particularly healthy, upright and bushy shrub with many stems shooting from the base. Very few thorns. Extremely fragrant with a distinctive myrrh scent. H: 4’ X S: 3’ Bushy habit. Blend of deep magenta, rose and pink. Large, fully double blooms. Classic old rose form. Strong fragrance.